Gateway To Canada Supports Teddy Casino! - Gateway to Canada | Canada Immigration Consultancy! Gateway To Canada Supports Teddy Casino! May 2 is Teddy Day! Gateway to Canada supports Teddy Casino, who is running for Senator. I hope you'll excuse this post. Somehow, Teddy's agenda is no different from the reasons why Filipinos immigrate to Canada. The current economic and political situation in the Philippines is one of the major factors why we chose to immigrate. We all want a better quality of life. But with the current set-up, where only the rich and powerful gets elected in the Senate, the powers-that-be are able to maintin the status quo: the rich gets richer, the poor gets poorer. But this must be stopped! This coming May 13, 2013, let us all make that one vote count. Let's vote for Teddy Casino (#6 in the ballot) for Senator and put a KARANIWANG TAO in the Senate. Know more about Teddy Casino by visiting http://www.teddycasino.org/. 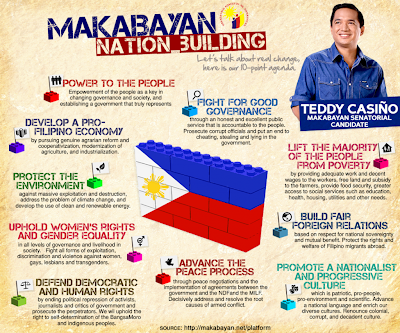 If you believe and agree with his advocacy, let us ask our friends and relatives to vote for Teddy. Karaniwang tao ang maglalagay ng karaniwang tao sa Senado. Salamat po!